PRODUCT TYPE: Valuable milky cream cleanses and removes make-up from face and eyes; thanks to the presence of jojoba oil, aloe juice and hyaluronic acid it nourishes, refreshes, moisturizes and soothes the skin. The carrot extract, it has a high content of beta-carotene, counteracts the oxidative processes of skin aging damaged by UV radiation. The skin will results clean, hydrated and soft. Suitable for all skin types. Excellent tolerability. COSMETIC FORM: O/W liposomal emulsion. INGREDIENTS (INCI): Aqua, glycerin, simmondsia chinensis oil, cetearyl alcohol, glyceryl stearate, potassium palmitoyl hydrolyzed rice protein, sodium stearoyl glutamate, aloe barbadensis leaf juice*, cetyl alcohol, helianthus annuus seed oil, daucus carota extract, phenoxyethanol, sodium benzoate, potassium sorbate, tocopherol, sodium hyaluronate, xanthan gum, p-anisic acid, parfum, sodium coco-glucoside tartrate, allantoin, retinyl palmitate, sodium phytate, ethylhexylglycerin, lecithin, ascorbyl palmitate, citric acid, anise alcohol. 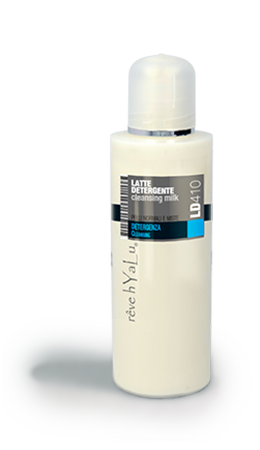 INSTRUCTIONS FOR USE: Morning and evening, apply a thin layer of cleansing milk to the face and around the eyes. Remove the excess with a ball of cotton wool or a damp sponge, apply TO420 Toner afterwards for complete comfort. After use, fully close the packaging. Keep product away from sources of direct light, heat and out of the reach of children. For external use only. JOJOBA OIL (SIMMONDSIA CHINENSIS OIL): Jojoba oil has a soothing and protective role. ORGANIC ALOE JUICE (ALOE BARBADENSIS LEAF JUICE*): Aloe juice has a beneficial soothing and refreshing role. CARROT EXTRACT (DAUCUS CAROTA EXTRACT): Carrot juice and pulp have a soothing and softening role, they are also used in beta-carotene (provitamin A). Vitamin A increases the enzyme activity in the cell and normalises cell division; it is useful in the treatment of dry skin and in fighting the ageing processes caused by UV radiation. HYALURONIC ACID (SODIUM HYALURONATE): Hyaluronic acid is a physiological component of the extracellular matrix of the skin’s connective tissue. As well as having a supporting and plumping function, it also serves as a water reserve for the skin, retaining enormous quantities of water. SODIUM COCO-GLUCOSIDE TARTRATE: A surfactant of 100% vegetable derivation; it presents high compatibility with the skin and mucous membranes, it is ideal for delicate products and for sensitive skin. VITAMIN A PALMITATE (RETINYL PALMITATE): Retinyl palmitate is a Vitamin A ester which leaves Vitamin A in contact with the enzymes of the skin. Vitamin A increases the cell’s enzyme activity and normalises cell division. It is therefore able to fight against ageing processes and improve the appearance of skin damaged by UV radiation. SUNFLOWER OIL (HELIANTHUS ANNUUS SEED OIL): Sunflower oil is particularly rich in Vitamins E and F. It has nourishing and softening properties.